school children, 1000-strong conferences, a groom on bended knee, Royal Television Society & featured on BBC's North West Tonight. Leave it to the experts--the North West's premier flute & string quartet , specialists in the field since 1982. The relaxing, easy-listening sound of our string quartet & flute really does work as background music for all types of events in Manchester, Cheshire, Derbyshire, Lancashire, Merseyside, Liverpool, Wirral--in fact the North West ! 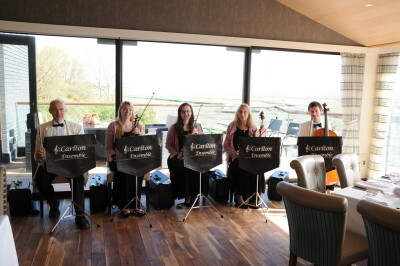 For parties, weddings, funerals, product launches, awards dinners, receptions, listen-and-lounge time after the meal, we offer the most varied musical selection around. Hear our string & flute versions of 60's , 70's, 80's, 90's & noughties' hits online. If you like what you hear but you're not clued up on classical music , just email us or pick up the phone to have a chat. If budget's your concern, please call - we aim to be accommodating & considerate of your finances too. We provide music for your very special day, your rite of passage & we pull out all stops to make it work.